"If you do come work here, we're gonna be family too." Jessica Pearson, in a flashback, utters this line to Harvey about half-way through the Suits mid-season finale titled "Faith." There are few things closer to my heart than the two themes of this episode -- faith and family. As his wedding approaches and the web of lies becomes thicker and more difficult to navigate, Mike seeks out the counsel and advice of his former priest (which is interesting because I don't think we ever got the sense that Mike was a religious person to begin with), but there's something that is holding him back. In the same vein, Harvey seeks out Dr. Agard's advice on whether or not he should resign to get Forstman to stop backing Daniel Hardman. Instead of discussing that, they discuss deeper-rooted issues in Harvey that are preventing him from making decisions he knows he needs to make in the ways he needs to make them. 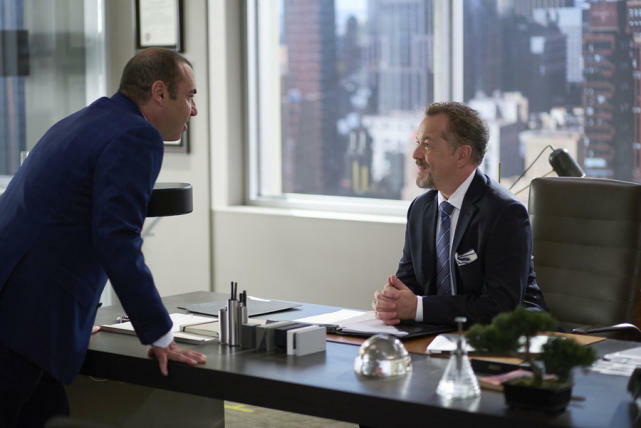 Meanwhile, back at Pearson Specter Litt, Jack has called for an emergency vote and Hardman has made it impossible for Louis to vote for Jessica by threatening Esther's company. All of "Faith" seamlessly navigates flashbacks between Jessica, Harvey, and Mike and seeks to explore what exactly causes us to make the decisions that we do. Is faith alone enough to save us? Will family be the thing to redeem and restore us? The mid-season finale seeks to answer these questions and the emotional fallout of their answers. Here's the thing that I've learned about Suits' promotional department -- they never reveal even a quarter of the material that is present in a midseason finale. Last season's "This Is Rome" appeared to be an unassuming, relatively quiet in-office finale... until the final few minutes of the episode blew literally everything up and back to the ground (and Rick Hoffman delivered a stunning performance). I went into "Faith" rather uninvested. It's not that the first half of this season has been bad, by any means. The writing has been consistently decent, with only a few missteps (I think the show really is lacking in levity now that Donna is isolated, though her quips with Louis are great; the Esther/Harvey thing was a big misstep in my opinion; Mike/Rachel's engagement was only "meh" until tonight's episode and Rachel in general hasn't been well-utilized in years, minus "Mea Culpa"). So I don't say this lightly when I say that "Faith" is probably the pinnacle of quality for this series. It made me laugh, it did right by all of its characters, the acting was FANTASTIC across the board (more on that in a bit) and it made me emotional. Like, really emotional. Like... multiple times. So let's talk about the stories. After his conversation at the end of last week's episode, we were all curious about who Trevor went to go see who got him back on the straight and narrow. This week, Mike -- while rifling through a box of old things -- flashes back to the day he found out that his parents died (in a heart-wrenching scene that should have been an indicator of what was to come in the episode). So he takes a trip and we discover that the trip is to visit his childhood priest. This is a really interesting contrast and especially more interesting when present-day Mike Ross is paralleled with childhood/teenage Mike Ross. Mike tells his priest that he's a good person and that he wants to get advice on what he should do with his life and impending marriage and, oh yeah, LOOMING SECRET. Something really striking happens though: the childhood priest doesn't think Mike's a good person. He thinks Mike is a fraud and calls him out on it. The priest then says what most of us would say to Mike if we got the chance: he doesn't want to be told of his problems. He doesn't want to be told that all the lies he's constructed are wrong. Mike wants someone to justify his secret -- to say that being a fraud was okay because he's helped lots of people and deep down, that's why he's a good guy. The priest doesn't let him take that route and I love it. I love that Mike was finally forced to confront not just his behavior but the root of WHY he's doing it repeatedly. Because for as smart as Mike may be, he's a pathological liar. He's lied and told dozens (maybe hundreds) of people lies before just to keep himself from getting into trouble. No matter what context he's doing that in... is he right? Furthermore, why is Mike still a fake lawyer? What is keeping him tethered to the work? Is it because what he's doing is making a difference in the world? That's the excuse Mike gives to the priest. He says that he's helping people and that he doesn't know why he came to the church in the first place. But the priest pokes at Mike's emotional armor until the young man finally gives up and yells -- in a church that echoes -- that he is scared. He came to his childhood priest for advice because he is terrified, deep down, that he will lose Rachel the exact same way he lost his parents. What is so beautiful about Mike's story is the same thing that's beautiful about Harvey's in this episode: in order for both men to fully heal and to grow, emotionally, they had to address the root of their problem. In order to Mike to really change, he had to untangle himself from the web of lies he's told HIMSELF and finally confront the things he's hidden behind for so long. And Mike's not a terrible human being. He's really not. He was hurt as a child -- hurt by the death of his parents, hurt by the lack of answers, hurt by the church, hurt by other people, hurt by memories and constant reminders of happy families around him. And instead of dealing with those hurts, he masked them and mislabeled them. But when Mike finally broke down in this episode? It was absolutely heartbreaking and beautiful. Because it was a moment that Mike realized something: he may have lost his faith in happiness and in family a long time ago, but that didn't mean his family ever lost faith in him. The priest takes him to the library, where his grandmother's name is on a bookcase's plaque. It's a bookcase that is in loving memory of her and when Mike looks closer, he begins to sob. On the shelves are all of the childhood books Mike once read with his parents that he discarded years ago. He tried to throw away his pain, but his pain came back. And it didn't come back to bite him. It came back in the form of his grandmother, loving him. It came back in the form of his parents, loving him. It came back in the form of the priest -- a man Mike once counted as a problem to be rid of -- loving him. And in that moment, Mike realized that the choices he made in his life were his own and in order to truly step out on faith and move forward, he had to stop hiding behind excuses and justification and start clean. And then is arrested, shortly thereafter, for conspiracy to commit fraud. Crap. "Faith" was all about the emotional breakthrough, which meant that Harvey had one of his own, similarly involving the idea of "the choices you make are your own." Harvey and Mike like to blame other people for the situations that they're in. And while Dr. Agard is a bit harsh in the way she phrases some things in this episode, she's also not wrong. Harvey has a burden on his shoulder because of the way that his mother cheated on his father and how he handled the situation when he found out. Instead of immediately confronting his father as an adult when he learned of his mother's infidelity (again), Harvey kept the information to himself and he let it fester. He let himself become angry and bitter. He let the secret poison his heart and his conscience until finally... he snapped. During a boxing session with his father, Harvey (pre-lawyer) tells his father, angrily, of the cheating. Harvey's father is obviously upset and hurt and blindsided and in the present-day, Harvey blames himself for blowing up his family with the secret. Dr. Agard takes an interesting approach when she notes that Harvey repeatedly keeps telling her that he "had no choice." It's something Mike has been using to justify his lies and his actions for years because of his secret. It's something Rachel and Donna and Louis and Jessica all do, really. They make hurtful decisions and claim they had no choice in the matter. But Dr. Agard is right -- Harvey DID have a choice. He could've confronted his father earlier about the infidelity. He could've broken the news gentler. But he didn't. Harvey used the secret and the confrontation of it as an excuse to act angry and to lash out at the people around him. And he still does that. Harvey doesn't want to know the root of his problem when he speaks to Dr. Agard -- all he wants is an answer. an easy-out. But she's not going to give that to him. Instead, she forces Harvey to come face-to-face with the emotional mistakes he's made in the past in hopes that he will not repeat them. Harvey, you see, determines everything not bold or brash or tainted with anger to be considered weakness. He doesn't want to resign because he sees it as "rolling over." But what he learns through his session is that resigning isn't weakness. Resigning is humility because it's putting Jessica's needs before his own. If they're truly the family he claims them to be, then it's HIS turn to save her. She's a strong woman, an incredible one, and he's a strong man. Strength doesn't mean arguing or railing against an injustice with more venom. It simply means knowing which battles to fight from the front lines and which require you just supporting the leader. I love that we got this humility in Harvey and I love that he's clearly learning to grow and mature emotionally. There's an absolutely beautiful scene near the end of the episode where Donna comes into Dr. Agard's office, looking for Harvey. Paula takes the opportunity to acquaint herself with Donna, and the redhead does similarly with the therapist. What results is this mutual respect and admiration -- Donna knows all of what Paula is thinking and Paula reveres Donna for her honesty. Harvey apologized to Donna... he thanked her, recently, and the woman knows that he never would have been able to do those things if it hadn't been for therapy. That moment was so wonderful and emotional -- so quiet and lovely -- because it was brimming with complete and total understanding between two characters who, until this episode, had never even held a conversation with each other before. So Harvey's story in "Faith" ends with him taking a leap, too -- he resigns from Pearson Specter Litt because it's the only way that Jessica can be saved. And when the woman protests, vehemently, and tells Harvey that she doesn't want him to be the one to leave, he simply tells her that she's going to have to find a way to forgive him, because his decision is made. I can't even express the utter joy and sadness I felt upon seeing this totally emotionally evolved version of Harvey. Jessica once told him that they were a family and she would protect him. Now it's his turn to protect her. In the flashback I opened the review with, Harvey essentially is telling Jessica about the trials he's facing in his home life because of one parent. He wants to escape his own home and live with her because, quite frankly, he's tired of his family. The funny thing is that Jessica tells him that even though they won't be blood relatives, if he ever gets a job at the firm, he will be her family. No questions asked. I say that it's funny, obviously, because we all know that this DOES happen and that Pearson Specter Litt really does become a family for Harvey, in some ways closer than his real one. This is true for Jessica, too, who -- as we see in the flashbacks -- gave up a husband and a family in order to commit to her work. The firm is Jessica's life and she's sacrificed time and energy and sweat and -- most importantly -- love in order to keep everything together. So when her family is threatened, she springs into action, as does Louis. There's one snag though in Louis' plan to defend Jessica: Daniel Hardman. You see, Hardman decided that if Louis didn't vote HIS way in the partner meeting and kick Jessica out of her position of power, he was going to ensure that Esther's company crumbled to the ground. When Louis confronts Jessica about this, the woman knows that there's nothing she can do or say that will help ease Louis' decision. Ultimately, she tells him that she knows where his loyalties in the firm are now, but that she too has a sister and knows the value of family. What I didn't really connect until now though is that Jessica must relate to Esther. Esther's entire life is now wrapped up in her business. If that crumbles, her life does too. So is the case with Jessica Pearson who spends the entire episode trying to prepare for war with the constant looming presence of the likelihood that she could lose it all in the background. Jessica is an amazingly strong woman, but I love that "Faith" showed us how easy it is for her to crack sometimes. There's a wonderful, powerful scene right after Louis leaves Jessica's office where she cannot control herself anymore and throws items from her desk at the wall. Donna enters at just the right time to find Jessica emotional and offers her help in any way possible. (Jessica then instructs Donna to go find Harvey.) But Jessica keeps her position at Pearson Specter Litt thanks to Harvey. She loses him, but it's the only way he can ensure she's safe. He trusts her to lead the staff. He trusts her leadership. And he knows that as long as she's in charge, it really doesn't matter what role he's playing. Our characters learned a lot of things about themselves, their emotions, and their capabilities in "Faith." On Suits, people often lie and cheat in order to get what THEY want -- in order to save themselves. And although some element of each story in this episode was about self-preservation, the larger idea was this: you need to have faith in other people and in the value of family. You need to sacrifice. You need to help lift other people up, even if that means giving up something you want in return. And maybe it will all work out. And maybe it won't. But either way, you gotta have faith. Seriously EVERY performer this week was a knock-out. Sarah Rafferty's quiet intensity in her scene with Gina Torres and Donna visiting Dr. Agard? Flawless. Patrick J. Adams absolutely knocked it out of the park in this episode, but specifically in the scene in the library. I was sobbing and I never cry during Suits. Like, ever. Gabriel Macht did a fabulous job at portraying the really soft, emotional side of Harvey in this episode. Harvey's final scene with Jessica was beautiful but the scene between Harvey and his dad while boxing caused my eyes to well up. Rachel Zane wasn't extremely prominent in this episode but Meghan Markle did an amazing job in the final scene while Rachel watches Mike being arrested. Rick Hoffman's scene with Gina Torres was... like, I don't even have words to describe it. The emotional range he displayed was so powerful and moving. And Gina Torres was an ALL-STAR this episode. Her breakdown in her office was beautiful and powerful. Everyone in this cast did a fabulous job in "Faith." "Take a picture, because tomorrow morning? Those letters are coming down." Yeah, Jack, but don't they pretty much do that on a bi-monthly basis anyway? Just saying. THIS SHOW HAS SUCH GREAT MUSIC. Someone find out who the music producer is and let me know. Because they're awesome. "It wasn't your weakness that made you break your word. It was love." Mike's hair in the flashback was SO BAD. Like, Oliver Queen's Hong Kong flashback wig bad. Also, if there is only one critique I have of the episode it is this: Gabriel Macht is an amazing person and Patrick J. Adams is great but they cannot pass for how young we were expected to reasonably believe they were in the flashbacks. It was bad. So bad. "How did you get past Stacy?" "I walked right by her." "It would've completely screwed up my life." "Oh, as opposed to how un-screwed up your life is right now." SASS. "There's a difference between intelligence and wisdom." Did we know Jessica had a husband? Did I doze off when that was mentioned before this episode? "Whatever happens, I want you to know... Pearson will always consider Litt her partner." OH AND THEN I LITERALLY JUST STARTED SOBBING HERE YOU GUYS. "I'll find him." Donna Paulsen, the queen of everything and everyone, please bow to her. "Families aren't built on lies." "How do you know?" "Because I have faith." "You really can do that." "Yeah, I can." "Harvey has no idea what he's missing." NO HE DOES NOT, DONNA, AND DR. AGARD IS AWARE OF THIS NOW TOO. "And for the record, you're not the only one who got more family out of this deal." OH DID I MENTION THIS IS ALSO WHERE I STARTED CRYING AGAIN? I believe my exact words for that final scene were: "OH SHIIIIIIIIII." Great episode! It was amazing after all these years of everybody expecting Mike to get taken away in handcuffs, they managed to shock us with it. There was a whole episode about Jessica's ex-husband. He had ALS and her and Harvey were the Executors of his estate when he passed away. Lisa, his new woman, inherited the ex-husband's company. Has anybody ever noticed that the episodes directed by Anton Cropper are the best episodes? They should just let him direct them all. I actually didn't like the Dr Agard and Donna scene. It felt weird under the circumstances have Donna sit there and say Harvey doesn't know what he's missing out on. Hello, Donna? You're supposed to be finding him not sitting there gloating. LOL! When the season resumes it would seem that Harvey will want to take back his resignation. I don't know how they plan to make Hardman & Forstman go away quickly? They are going to have so much else to focus on and you don't want to have those jerks taking up more screen time while Mike's world is exploding. Interesting dilemma for the writers. What I really want to know it, could Harvey also be arrested for conspiracy in the first episode back? It was amazing after all these years of everybody expecting Mike to get taken away in handcuffs, they managed to shock us with it. That bait and switch THREW me for a loop. Because you're 110% correct: after years of eye-rolling over Mike's secret and moments he almost got caught, the moment he got caught (for something because I still don't believe it's for being a fake lawyer), I was shocked. Thank you for reminding me of that episode with Jessica! I totally remember that story now, but I couldn't recall if we had actually seen him before. Agreed. While this finale was stellar, there are too many moving pieces now that need to be put back and a quick-fix in the premiere won't solve them. So I'm definitely interested to see how this will all go down. As people pointed out though, I don't think Mike's getting arrested for his secret -- they arrested him on "conspiracy to COMMIT fraud," not actually fraud itself. So that begs the question: did the priest turn Mike in for stealing money? (It seems doubtful and I'm pretty sure Aaron Korsh addressed that in the TV Line interview he did.) The wording was purposeful but the action meant to throw us off. So now I'm interested in what they think he conspired to do. I doubt Harvey will be included because it doesn't seem likely that what Mike was arrested for was the secret itself anyway. We already knew that Jessica was married. Her Husband was a scientist at a pharmaceutical company and had ALS ( I think) and came to her for legal help but they were already divorced by then. So basically their marriage went on about the same length as Harveys Havard years. Excuse my english, I'm from Germany. Question though: Why does Mike fear that Rachel will leave him if he stops being a fake lawyer? At what point has she given any indication that she loves him for his job? I think we have ample proof that she actually sort of hates this fraud lifestyle of his: she told him to quit when she first found out, she told him to take the IB job when he had the chance, and she was visibly shaken when he said he was coming back to PS in s4. On top of this, he can see the stress her secret is putting on her now that they're getting married. So at what point did Mike get it in his head that Rachel actually prefers him as a fake lawyer? While the scene with Donna and the therapist was great to see (and long anticipated in my case) it did not make up for the severe lack of Darvey. And not only were they denied in this episode but in the previous one too! I thought for sure that once Donna found out about the panic attacks there would be a scene where he finds out that she knows and they talk about it. Something! And I also thought we'd get a scene with the two of them after Louis flipped his vote in 5.09. Harvey asked Donna for help because he was 110% sure Louis would do something underhanded to win the vote. Next morning Louis has completely changed his tune. Surely Harvey figured out that this only happened because Donna said something to Louis. Isn't he going to thank her?? Anyway, as a Suits fan I am happy. As a Darvey fan I am not happy. Thank you for the kind comments about the review! This episode was so much more emotional than I expected it to be for me and I loved that. Question though: Why does Mike fear that Rachel will leave him if he stops being a fake lawyer? At what point has she given any indication that she loves him for his job? I can MAYBE speculate on that -- consider the fact that Rachel has only known Mike to be a lawyer and assume, for a moment, that there's a part of him that is tied to that persona. Maybe he feels like if he let his entire guard down and if he became something else, Rachel would realize she doesn't love THAT man but lawyer!Mike. IDK, it was a bit of a shoddy reasoning for him to be so upset and I agree with you 110% about Mike needing to be more afraid Rachel would leave him BECAUSE of his fraudulent life and secret. I thought for sure that once Donna found out about the panic attacks there would be a scene where he finds out that she knows and they talk about it. Something! And I also thought we'd get a scene with the two of them after Louis flipped his vote in 5.09. This was the only major thing lacking in the finale. There's been zero Donna/Harvey closure recently. And I think that Korsh and the writers are so afraid of remotely touching them after what they did to the characters last season that they're just staying away entirely (which is bad because we need growth or movement or just a conversation). It's becoming frustrating because logic dictates that Donna and Harvey WOULD be talking more but Korsh appears to not be getting that particular memo. Ugh. Hi Jen, late comment I know but I didn't have time last week and I just watched this episode last night. It was a great episode acting wise, the best of this half season but I have to say that overall these 10 episodes have disappointed me A LOT. The acting was obviously great but i don't understand the writing. I so agree with you that the Esther storyline was a huge mistake and totally random. I absolutely hated how they handled Darvey. I mean for Donna to find out that a man who she loves/is her platonic long time friend or wtv bs Korsh likes to tell, has panic attacks and to not have a scene between the two of them where they talk about it....cheap shot! Also, I read some Korsh interviews and I don't get it. I mean I am a law student but I live in Canada so I don't know exactly how US law works, but conspiracy to commit fraud is not the same thing as fraud itself. And what Mike did was actual fraud. Shouldn't he get arrested for fraud? :/ Maybe there is something I'm not understanding because Korsh said it was his secret being discovered and that it was about him not being a lawyer. And speaking about that, Korsh has said that he still does not know who told his secret, that they have to figure it out, and what will happen in the second half of the season. Honestly, what the hell! If he is joking it is just making him look bad. As a creator, to not have an idea about where you show is going in the next few months it just a little ridiculous. I love Suits but I really don't like Aaron Korsh and how he is handling the show and what comes with it. Anyways, as always great review Jen and please don't stop :) And also a question, will you continue to review Supernatural now that season 11 will start soon? Totally agree with you. Personally the show has disappointed me this season, I expected way more. It has more potential that they show IMO. They "destroyed" Darvey for the sake of drama that´s all, with no development at all. Donna is not the Donna we used to see. And finally Korsh, well no comment. I mean for Donna to find out that a man who she loves/is her platonic long time friend or wtv bs Korsh likes to tell, has panic attacks and to not have a scene between the two of them where they talk about it....cheap shot! AGREED. I'm seriously confused as to why there wouldn't have been a scene where Donna at least shows compassion. While at the same time, I understand that at this point -- because they're isolated -- she wouldn't want to confront him about it because it appears she would be showing him pity (which she wouldn't be, she would be showing compassion but we can all see a scenario in our heads where Harvey snaps at her for pitying him, etc.). I just don't get why there hasn't been a significant development for them throughout the first half of this season. We have a bombshell like that to end season four and kick-off season five and it seems that nothing has been resolved between them. We're even going backwards in some ways in terms of character development for them as a pairing (platonic AND romantic). I think Korsh is just afraid to touch them so he's backed ALL the way off of even writing anything to do with them. Which is wrong, of course, because the characters are the ones who end up suffering. I love Suits but I really don't like Aaron Korsh and how he is handling the show and what comes with it. Yeah I don't think he's doing so well in the Harvey/Donna department at all. At least some of the others emerged unscathed this season. And I love Mike a lot more than I did last year so there's something. Also, did Korsh really say the arrest was about his secret or A secret? Because I agree -- the wording was about "conspiracy to commit fraud" which seems VERY specific and obviously not about Mike's lawyer secret if he's been practicing fraud for five years now. I don't think it's about his secret and I hope I'm proven right otherwise that'll be a GLARING error. And also a question, will you continue to review Supernatural now that season 11 will start soon? My lovely writer Deena is the one who does our Supernatural recaps for us and she'll be back when the new season starts again! :) :) :) Glad you enjoy her pieces.